The island owns an unrepeatable popular architecture, a splendid naked, but sweet landscape, exceptional climate, a lot of beautiful sandy coasts. 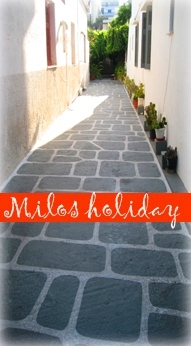 Furthermore,Milos is called the island with the 1000 beaches. Milos population is 5.000 residents who live in Plaka, the Plakes, Triobasalo, Pera Triobasalo, Tripiti, Pollonia, Zefyria and Adamanta.